Last month, we looked at enhancements that can make your Wild Apricot websites more mobile friendly using new templates that offer responsive design. This month, we’re focusing on the last step in phase one of our mobile strategy: the release of the Wild Apricot Android app for administrators – either full administrators or administrators with both membership and event management access rights. Like the Wild Apricot app for iOS devices (iPhones, iPads, etc.) that we launched six months ago, the Android app allows Wild Apricot administrators to perform a number of admin functions on the go. One of the biggest challenges facing organizations is dealing with event attendees at the door. Instead of lugging a laptop to the event, you can use your Android or iOS device to register attendees on the spot. If the registrant isn’t in your contact database, you can add them at the same time. You can also assign a membership level to make them a member right then and there. Another common issue for event administrators is distinguishing between registrants and attendees. With the Wild Apricot app, you can check in attendees and their guests, allowing you to track event attendance, not just event signups. 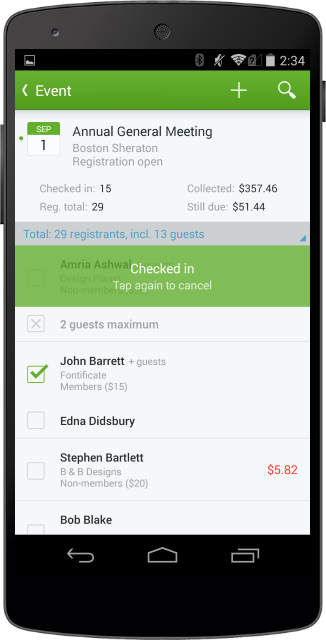 If an attendee hasn’t paid their event fee, the registration will be red-flagged, and you'll have the option of recording a payment at the door or checking them in and letting them pay later. Existing registrations can be adjusted on the go, with the changes being immediately and automatically reflected in your Wild Apricot account. We know it can be a challenge to keep all your contact information up to date. The last thing you want is to return from an event with a bunch of corrections jotted down on slips of paper. Instead, you can use the Wild Apricot app to search for members and others within your contact database, and modify their information. You can even archive a contact so that they no longer count towards your limit. For a look at the iOS app in action, click here. For more information on the mobile app features and functions, you can visit our Wild Apricot online help here. What’s next for the Wild Apricot mobile app? The initial version of the Wild Apricot mobile app was focused on addressing a number of key scenarios identified by our users in our community forums. Future versions will provide additional functionality, as suggested by our users. 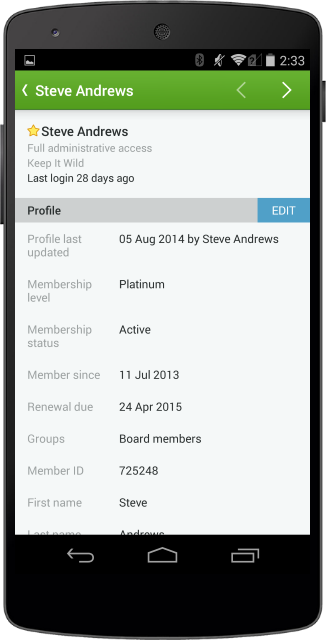 For example, Version 1.1 of the app will include access for limited administrators – currently only full account administrators and administrators with both membership and event management access rights can use the app – and the ability to log in to the app using Facebook or Google+ credentials. With a Wild Apricot app for administrators now available for both iOS and Android devices, the last of the key pillars in our mobile strategy is in place. The other pillar was put in place over the winter with the release of two responsive website themes – Bookshelf and Whiteboard. Wild Apricot websites that use responsive themes automatically scale their contents to fit properly on different sized screens, making the sites mobile-friendly for your members. Responsive themes aren’t just about making a site look good on a smartphone, they’re also about allowing your members to perform self-service functions on the go without excessive scrolling or zooming. Two more responsive theme sets are on the way – currently scheduled for release in April – with several more on the drawing board. For those of you who are happy with your current theme and don’t want to switch, we have begun creating responsive versions of existing themes. The first of these – a responsive version of the Treehouse theme – should be out sometime this summer. You can also find information on designing responsive pages in our Wild Apricot online help here. In the next stage in our mobile strategy, we will build on the foundation of our first phase, expanding the functions available in our mobile app, and improving upon the quality and selection of our responsive website themes. As always, the expanded functionality will be driven by your needs, as communicated to us through the Wild Apricot user community forums. You can follow our progress and see where your feature requests sit in the development queue by checking out our product roadmap. With our mobile app available on both iOS and Android platforms, and the first wave of responsive themes, Wild Apricot has delivered on its promise to help our users and their members go mobile. Wonderful news! I love the iPad app but my phone is an Android and I have been waiting for this!!! Thanks for your patience, Tracey. We're happy to have everyone on the same page now. When will the app for members be available? ?